Leased office space offered at this centre. This building is situated close to nearby transport and comes with fully functional office suites with the use of conferencing facilities and administrative support offered when needed. 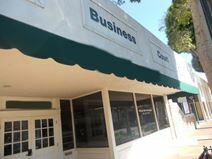 Located in the beautiful and Historic Uptown Whittier this center brings style and convenience to your office location and is conveniently located near restaurants, shopping and quick access to the 605 Freeway on Whittier Blvd. Offers offices of various sizes to create a professional working environment.